RKK Energia, Russia's chief manufacturer of manned spacecraft, reiterated on January 26, 2010, that the first unmanned launch of the new-generation spacecraft intended to replace Soyuz would take place in 2015. Speaking at the 34th Korolev Readings at prestigious Bauman Technical University in Moscow, the head of the company, Vitaly Lopota, said that the new vehicle would likely make its maiden voyage into space from the yet-to-be-built Vostochny Cosmodrome in the Amur Region of Russia, however if the facility was not ready, the mission would originate from Baikonur, Kazakhstan. Lopota did not elaborate on when RKK Energia would have to make a commitment to one launch facility or the other or which launch vehicle would be used for possible missions from Baikonur. The Rus-M rocket, whose development officially started in 2009, was specifically designed to support the new manned space program and it was to be based exclusively in Vostochny. Therefore, even for temporary missions from the Kazakh launch site, yet another newly developed vehicle or an existing rocket would have to be adapted to carry the new-generation spacecraft, known as PTK NP, into orbit. The Ukrainian-built Zenit launcher or a similar Russian-built vehicle would be a likely candidate, because it had a payload capacity of up to 13 tons, which is needed to lift the future spacecraft, and it also had an operational launch pad in Baikonur. The Soyuz rockets, which currently launched the seven-ton Russian manned spacecraft from Baikonur, were not powerful enough to carry the future ships. Although the 2015 launch date for the PTK NP was announced back in 2007, Lopota's statement was the first to disclose the possibility of using Baikonur as a launch site for the new-generation spacecraft. Previously the Russian prime-minister Vladimir Putin had admitted that the construction of a brand-new launch facility in Vostochny in Russia's remote far-eastern region had turned out to be more difficult than originally expected. Unofficial reports also said that completion of the launch center by 2015 was impossible due to lack of funds. The Russian government had planned the development of a launch site for the manned space program on the Russian territory ever since the disintegration of the Soviet Union had left Baikonur in the newly independent republic of Kazakhstan. Previously, Russian industry sources cited the possibility of adapting the veteran Soyuz spacecraft for possible lunar missions, in case current efforts to develop PTK NP stalled. The three-seat Soyuz first flew in 1966 and was originally intended to beat the US Apollo to the Moon. In the past several years, Russian space officials have promised to prepare for possible manned lunar missions within the timeframe of the NASA effort to return to the Moon around 2020. In addition to ambitious plans to develop a new-generation spacecraft, Lopota added his voice in support of an aggressive Solar System exploration program in Russia with the use of nuclear-powered spacecraft. Echoing a number of Russian space officials before him, the head of RKK Energia promised the development of a powerful space-based nuclear power source in the following 10-15 years. According to Lopota, nuclear energy would provide electricity to large communications platforms, Earth-watching radar and optical satellites and even early-warning network of spacecraft designed to protect Earth from dangerous asteroids. However, the ultimate goal of the nuclear power sources in space would be to support the most ambitious goals of deep-space exploration, such as missions to the Moon and planets of the Solar System. Lopota cited the possible use of nuclear energy to power a permanent human base on the Moon. Last November, Russian president Dmitry Medvedev, in a televised address to the Federal Council, endorsed the development of a space-based nuclear power system as a high-priority national goal. On May 27, 2010, RKK Energia's scientific-technical council, NTS, conducted a five-hour meeting, which reviewed and approved the results of preliminary design work on the PTK NP project. The meeting was accompanied by an exhibit in the NTS meeting hall, demonstrating the technical, production and testing foundation of the project, RKK Energia elaborated on June 2, 2010. However the announcements only featured photos of key space officials, including the company president Vitaly Lopota, deputy designer general Zelenshikov and the chief of the manned space flight directorate at Roskosmos Krasnov. No visuals of proposed hardware or technical details on the spacecraft and its launch vehicle variants, which had reportedly been presented at the meeting, were released. Radio systems and electronics gear. According to the announcement, NTS made a decision "to deliver technical documentation of the project to the overseeing bodies of Roskosmos for the expertise and determination of further direction of work in the development of the prospective manned transport system." On July 19, 2010, Russian Prime Minister Vladimir Putin pledged a renewed support of the Russian government for the funding of the new space center. During his visit to RKK Energia, the nation's key manned spacecraft development center, Putin promised 24.7 billion rubles over following three years for the construction of the Vostochny (Eastern) launch site in the Russian Far East. The future space port was conceived primarily for manned space missions and was intended to end Russia's dependency on the launch facilities in Baikonur in the former Soviet republic of Kazakhstan. Key officials at RKK Energia missed the opening of the air show in Farnborough, UK, on July 19, 2010, in order to meet Putin at the company's facilities in Korolev. Ironically, RKK Energia's display in Farnborough centered around a proposed launch vehicle which would enable Russia to fly its next-generation manned spacecraft from Baikonur instead of Vostochny. The plan was drafted in response to wide-spread belief within the industry that the construction of the Vostochny launch site would not be completed on schedule due to limited funding. Reliance on the new center could put the introduction of the new manned transport system years behind schedule, sources within the Russian space industry said. Putin's remarks during his visit to Korolev were clearly designed to remove all doubts about the project. As of July 2010, a crucial meeting of the Scientific and Technical Council at Roskosmos was expected to finalize the review of the PTK NP preliminary design in early August 2010 and formally request RKK Energia to implement the required changes. The company would then have around a year to deliver a revised project before entering the next phase of development, known as the Technical Project. During the 61th International Astronautical Congress, which opened on Sept. 27, 2010, in Prague, Russian officials confirmed that despite all the doubts and economic problems, which had plagued the world economy in the previous two years, the first manned mission from Vostochny had remained scheduled for 2018. The next-generation manned spacecraft, designed to launch from Vostochny, had passed the preliminary design phase and was about to enter the technical development stage, Russian officials confirmed in Prague. According to Aleksandr Krasnov, the head of manned space flight directorate at Roskosmos, the agency’s key research center – TsNIIMash – in cooperation with the industry was clarifying technical details of the project, including the design of the ship’s controversial rocket-powered landing system. On Oct. 27, 2010, Roskosmos announced a federal tender for the second phase in the development of the next-generation spacecraft, PTK NP. Officially known as Technical Project or OKR for Opytno-Konstruktorskie Raboty - Research and Development Work, R&D, this stage of work on the spacecraft would continue for two years until December 2012, with a price tag of two billion rubles ($65.2 million). All bids by the industry would have to be submitted by November 29, 2010, and the winner of the tender would be officially selected in the first days of December. Due to unique nature of manned spacecraft technology, only two Russian organizations -- Korolev-based RKK Energia and Moscow-based Khrunichev enterprise -- possessed the necessary experience to compete in the tender. RKK Energia, as the prime developer of the nation's manned space systems and the main contractor in the preliminary design of PTK NP, was essentially assured to win the contract. The agency's requirements for the Technical Project instructed the industry to focus on two versions of the next-generation spacecraft -- PTK-Z designed for long-duration autonomous missions in the Earth's orbit, and PTK-S intended to service an Earth-orbiting station, such as the ISS. 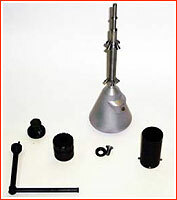 Other "flavors" of the PTK spacecraft, which were drafted during the preliminary design, including a lunar orbiter, were deferred to the second stage in the PPTS development program. The tender for the Technical Project of the next-generation spacecraft was announced only days after the development of the launch vehicle to carry this ship into orbit also officially entered a second phase of development. 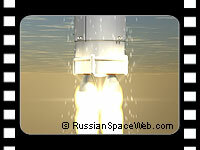 Russian work on the new-generation spacecraft would parallel the development of similar vehicles in the US and Europe. The focus on the spacecraft for carrying crews and cargo to and from the station clearly seeked to compensate for the retirement of the US Space Shuttle next year. 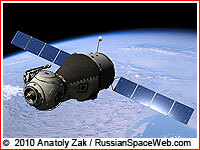 Beginning in 2011, Russian Soyuz spacecraft would be the only vehicle capable of delivering humans to the ISS. On Dec. 20, 2010, RKK Energia signed a contract No. 351-9990/10 with Roskosmos funding the development of the Technical Project for the PPTS system. The work assigned by the contract had to be completed by December 2012. According to the requirements of the Technical Assignment (TZ.0008.173), the first phase of the PPTS system included two manned systems with the spacecraft for the autonomous flight and for docking missions with orbital stations and autonomous modules. Each system included a complex with the Rus-M launch vehicle, the manned transport spacecraft, pre-launch processing and support facilities. 2009 Feb. 14-16: The Federal space agency, Roskosmos, accepts proposals from the industry for the development of the PPTS launch vehicle. 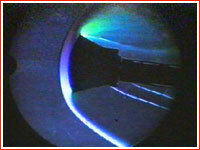 2009 March 16: Roskosmos representatives unseal proposals for the development of the PPTS launch vehicle. 2009 March 19: Roskosmos formally names TsSKB Progress a winner of the tender for the development of the launch vehicle for the next-generation spacecraft. 2009 March 30: Roskosmos officials unseal envelopes with proposals for the development of the PPTS system by RKK Energia and Khrunichev enterprise. 2009 April 6: RKK Energia is awarded a contract to develop the preliminary design of the PPTS system by June 2010. 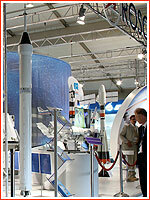 2009 August 18: RKK Energia demonstrates the first scale model of the PTK NP (PPTS) spacecraft at Moscow Air and Space Show, MAKS. 2009 Oct. 2: RKK Energia and Boeing company sign a memorandum of intent in Moscow for joint development of the common docking mechanism based on the APAS system for the next-generation spacecraft. 2010 May 27: RKK Energia conducts a meeting of scientific-technical council, NTS, reviewing the results of the preliminary design of the PTN NP project. 2010 July 19: Russian Prime Minister Vladimir Putin pledged a renewed support of the Russian government for the funding of the new launch center. 2010 Oct. 27: Russian space agency announces a tender for the Technical Project of the PPTS system and releases technical requirements for PTK-Z and PTK-S versions of the next-generation spacecraft. 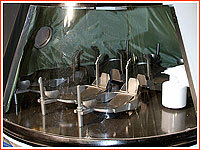 2010 Nov. 29: A deadline for submission of bids for the Technical Project of PTK NP spacecraft. 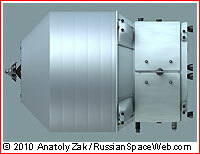 2010 Dec. 3: Russian space agency to review industry bids for the Technical Project of the PTK NP spacecraft. 2012 December: The Technical Project for the PTK NP spacecraft to be completed. 2015: The Rus-M launch vehicle to fly its first unmanned test mission from Vostochny, carrying a cargo version of the PTK NP spacecraft.